We live in a world of pre-blazed trails, of Google Maps and endless shelves of travel books detailing every motel, every restaurant. The most amazing discovery most of us are likely to make is a great new burrito place, and even that we would have heard about if we checked Yelp more often. Whether or not you know it, that same wanderlust that whispered into the ears of your ancestors and led them into the forests, into the oceans, still calls out to you. In those moments when all seems at peace, all seems safe, it's that persistent, ceaseless call of "Yes, but what else?" 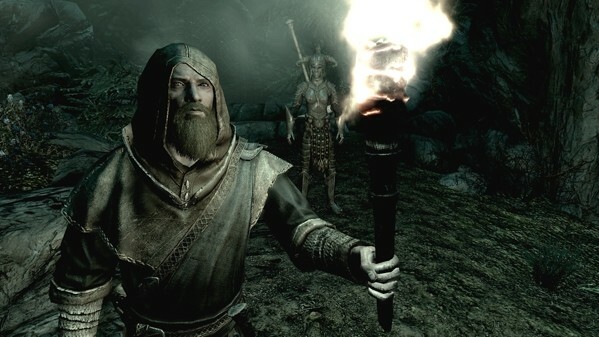 The Elder Scrolls V: Skyrim is the answer to that call. Set 200 years after the Oblivion Crisis, Tamriel is a far different place than players left it at the end of Elder Scrolls IV. The Blades are all but dissolved, mages have become insular, relegating themselves to an isolated college and the Thieves' Guild scarcely deserves the name. No, the focus has shifted from the fantastic to the political, with the assassination of the king of Skyrim triggering a civil war between those loyal to the empire and a band of rebels. All of the strife is soon overshadowed, literally, by the return of dragons to Tamriel. 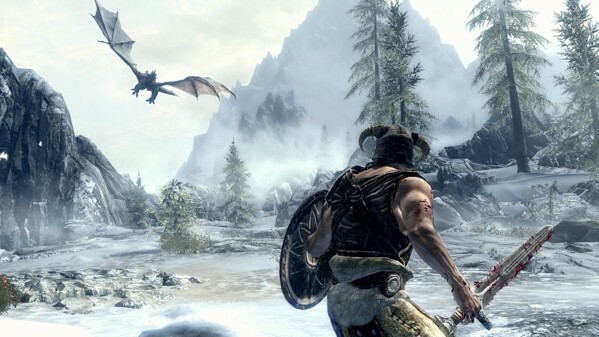 The dragons don't pick a side -- Imperials and Stormcloak rebels both taste the same to them -- so the people of Skyrim must put aside their differences to preserve all life from extinction. Of course, people have never put aside their differences for anything, so they turn to the one person that prophecies say can save them. The one who walks between the worlds of man and dragon like a scalier, fire-breathing version of Blade. The Dovahkiin. ... That's you, by the way. Thanks to the dragon's soul that dwells in your body, you're able to "shout" the dragon language, which has the happy side effect of setting things on fire, freezing stuff, disarming enemies, calming animals, etc. In practice, shouting is a selectable support ability to weapons and magic, and one you'll expand by learning new shouts written on ancient cave walls and the like. So: Dovahkiin discovers he or she is half-dragon. He or she has to stop the dragons. These two facts are pretty much the only absolutes. It is entirely up to you what path your hero takes between those two points. Every group I've mentioned above presents their own quest lines that can take upwards of six or eight hours to complete, depending on how good you are at staying on track (which, one could argue, is kind of missing the point). This is the deepest, loveliest world ever created for a single player to explore. I want to linger here, because expressing the scope of this game is going to be a challenge, and this is a fine way to start chipping away at it. I "finished" the main quest of Skyrim after playing for 65 hours. In that time, I only finished the quests for half of the groups I mentioned above (plus quite a few I'm intentionally keeping secret), and I don't know how many more there are. How can I still not fully understand the game's scope after 60 hours? I'll give you a rare specific example, which you're more than welcome to skip. In one of the countless treasure chests I looted, I found a mysterious stone. No sooner had I dropped it into my inventory and walked away than the stone started speaking to me and ordering me to become its "weapon of light" and cleanse its temple. This was 30 hours into the game and this kind of craziness was still going on. How many more paths like the one above could I have found with infinite time to play? I have no clue, and it's sort of beside the point. Bethesda has created one of the only games I can recall where the world is so steeped in "stuff to do" it creates the illusion of a world completely without limit. Its scope defies the very notion of "completion" as we've come to think of it relating to games. While the stories and rewards are always different, there is a certain ... sameness that sets in with many of the missions. You'll notice a lot of people want a lot of specific items in caves or castles they're too chicken to explore. Keep in mind: I played a lot of missions in a short amount of time, so the repetition may not get to you. But a few more that required smarts over brawn would have been appreciated. The rewards for taking on these quests are often very practical, like a new weapon or precious stone, but you'll just as often be rewarded by a gorgeous landscape or cave system. 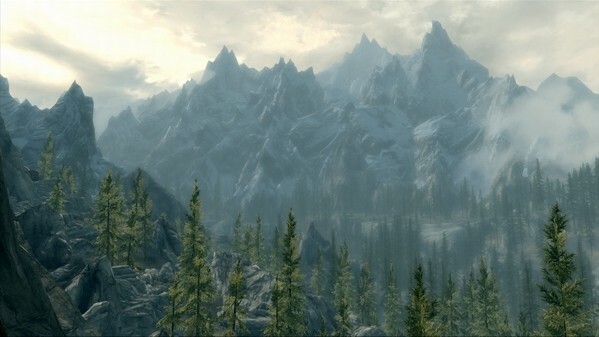 Skyrim is the northernmost part of Tamriel and it's populated equally by verdant pastures and snow-blanketed mountain ranges. Some of the areas in the far north are so terrifyingly frozen I assumed they were hurting me even when they weren't. In fact, I'm not ashamed to admit that often, upon reaching a village after a particularly harrowing trip through the snow, I'd make a beeline for the warmth of the local inn even though it had no discernible effect on gameplay. How you'll cut your path through the world is slightly more linear than the world itself. Dovahkiin has eighteen skill trees to follow like destruction magic (throwing fireballs and the like), one-handed weapons, picking locks, etc. To get better at any skill, you just have to practice it until your aptitude increases. Increase your aptitude enough times in any persuasion and you'll gain a level and, with it, a perk you can apply to any skill. Perks can range from the mundane (specific spells cost less mana) to the more specialized (defensive spells become more powerful if you're not wearing armor). It may seem by-the-numbers, but it's actually a fairly revolutionary idea in terms of a role-playing game. There are no base attributes. No intelligence, no strength. The only thing holding you back from being the best swordsman in Tamriel is a few hours of practice. Better yet, you can map entirely different abilities to each hand, so you can practice your invisibility spell while you practice blocking with your newly crafted shield while you shout fire at a bear. Dovahkiin's most impressive skill? Multitasking. To keep the weapons and abilities you're focusing on top of mind and easily accessible, you can create a list of your favorites, accessible at any time with a single button press. It's convenient, but still not an elegant enough solution. If you, for example, want to alternately cast healing and fire spells as you attack with your right hand, you're going to spend a lot of time stopping the fight to swap between the two. A radial menu of favorites might have alleviated the problem, but the simple alphabetical list of spells, weapons and armor is a chore to dig through. Speaking of chores: What should be thrilling fights in Skyrim are often weighed down by the same clunky melee system Oblivion suffered from. In fact, even the word "system" is pretty generous considering we're just talking about hammering on the right trigger. While Skyrim has expanded the series in almost every conceivable direction, its mindless melee still feels rooted in the past. Having a lightning bolt in your left hand helps, make no mistake, but it's no substitute for real variety in the swordplay. It's a recurring theme, actually. Depth in Skyrim is often sacrificed for scope. Most every individual system in the game has been explored more fully in other games, but there are just so many of them and so much flexibility, it's tough to get too perturbed. That expanse comes at a price, however, in the form of frequent, 5-10 second long load times. It's not typically too much of a distraction, but when you're on a quest taking you in and out of several buildings in a row it can wear on you. But considering that you can ride from one end of Skyrim to the other without a single pause, the occasional interior loading is a relatively minor inconvenience. Sadly, I can't extend the same pass to the game's wholly unsurprising yet still pretty disappointing technical problems. I don't mind a little jank in a world this big, but five hard freezes, a mask that made my face disappear for much of the game and an entire dungeon where I inexplicably had unlimited magic? It's too much. Will it all be smoothed out eventually? Sure. (A day-one patch has already been deployed.) But is it a frequent distraction from what should be the ultimate immersive experience? You bet. More importantly: Will you still be bothered by it when a dragon drops from the sky as you draw your sword, the Skyrim theme kicks in and a chorus of disembodied barbarians start chanting your name in what will go down as history's most epic "I double-dog dare you"? I promise, friends: You will not. This is the deepest, loveliest world ever created for a single player to explore, and one that no one should deny themselves. This is a game about following Emerson's advice, leaving the trail and finding that the most powerful force on Earth or Tamriel isn't fire or sword, but the ever-insistent desire to know what lies beyond. This review is based on 360 code of The Elder Scrolls V: Skyrim provided by Bethesda.